Growing up, all of the kids had their favorite thing that I used to cook. For our son Buck, potato salad was always one of his favorite things. 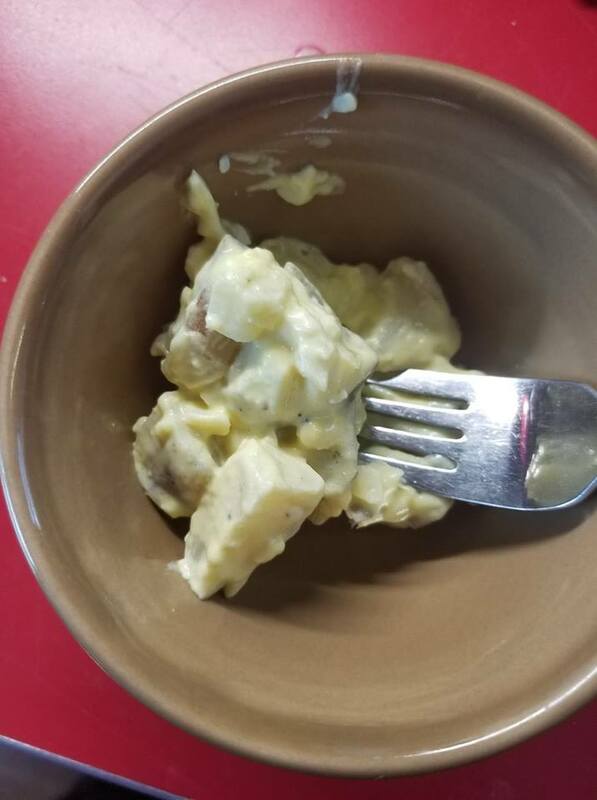 If you have a family like our family, you might get a little particular about your potato salad….Hubby is so particular that he rarely ever eats any if it’s anyone’s potato salad except mine. I’ve even seen him leave potato salad on his plant and not finish eating it if it’s not my potato salad. He doesn’t like it too mayo…or too mustard. He likes extra pepper. 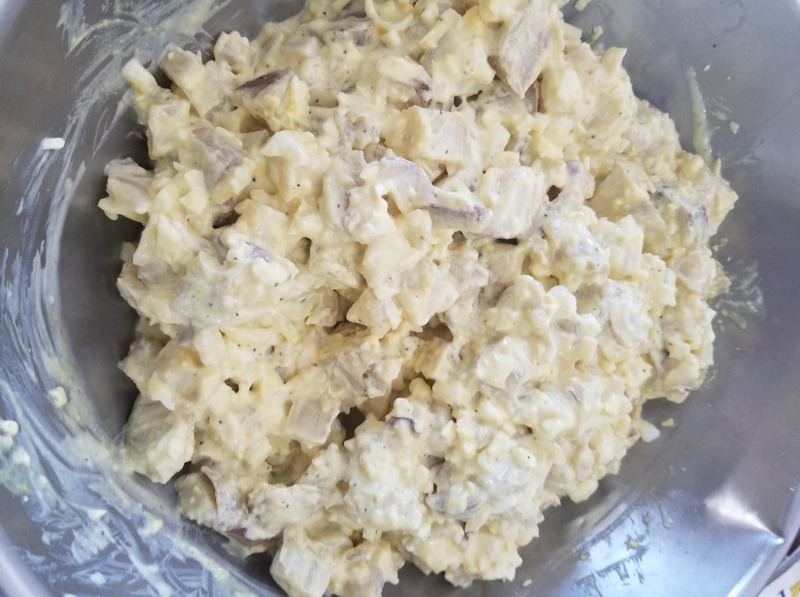 I can vividly remember the first time I called home and asked my mom how to make potato salad….I remember her telling me, much what I’m going to tell you…eggs, potatoes, onions, mayo, milk, mustard, salt, pepper and the secret ingredient…SUGAR. 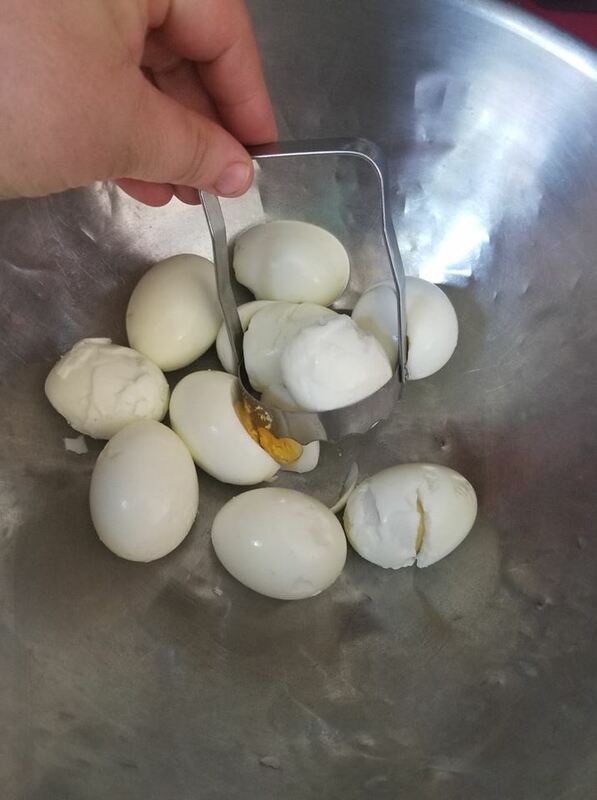 I boil eight eggs…then peel them. I chop them up with my little chopper. I like it about this fine. 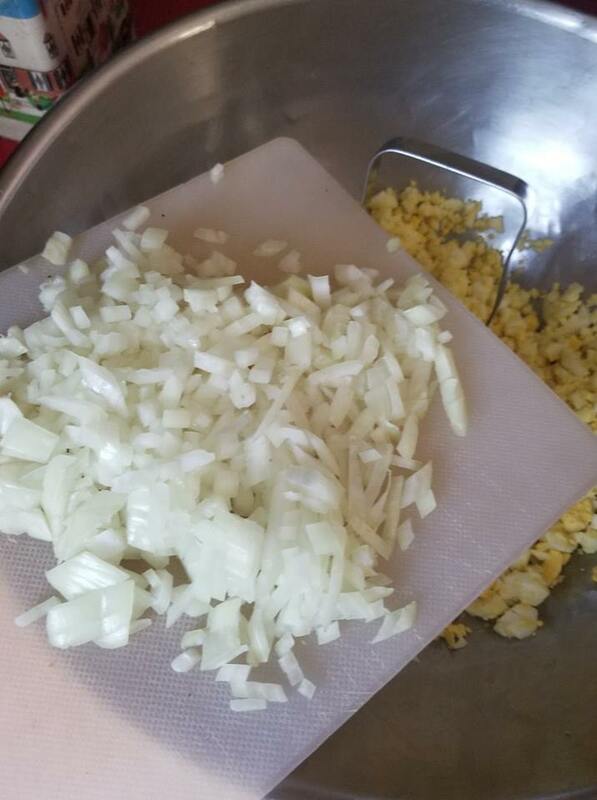 Next up…onion.This was half of a super large onion chopped. This is about 5 pounds of potatoes. I always use red potatoes. I always half peel them and half not peel them. I do manual pressure for 18 minutes. Once cooled, I chop them up too. Next is the hard part to tell measurements about. I take (what we call) a cereal bowl and put in about that much mayo. I add about 1/4 cup sugar, a really big squirt of mustard, salt and pepper to taste, then fill the bowl about this full of milk. I mix it all together and this is what I end up with. Sometimes I end up adding a little more mayo but usually not. Then it’s taste testing time…here’s where I might end up adding a little more salt or pepper. This time, it was just right…It was even approved by Buck when he was home. How do you make potato salad? Is it like mine…are you one the rice’s your potatoes? What’s the secret to your family’s favorite way of making potato salad. This entry was posted in recipes on July 21, 2018 by Jo. 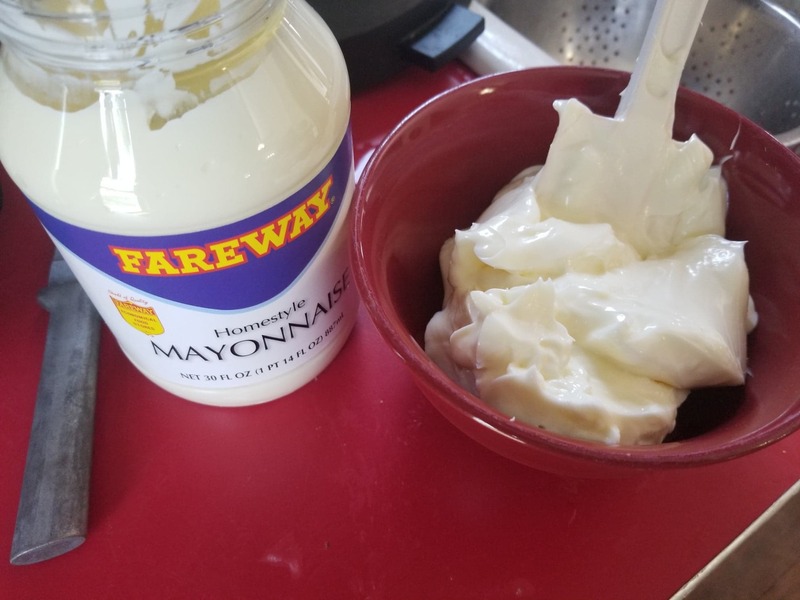 I mix a big spoonful of mayo/Miracle Whip and a slightly smaller spoonful of plain yogurt or sour cream in the bottom of a big bowl. Then mix in about a teaspoon of mustard and a teaspoon of celery seed. 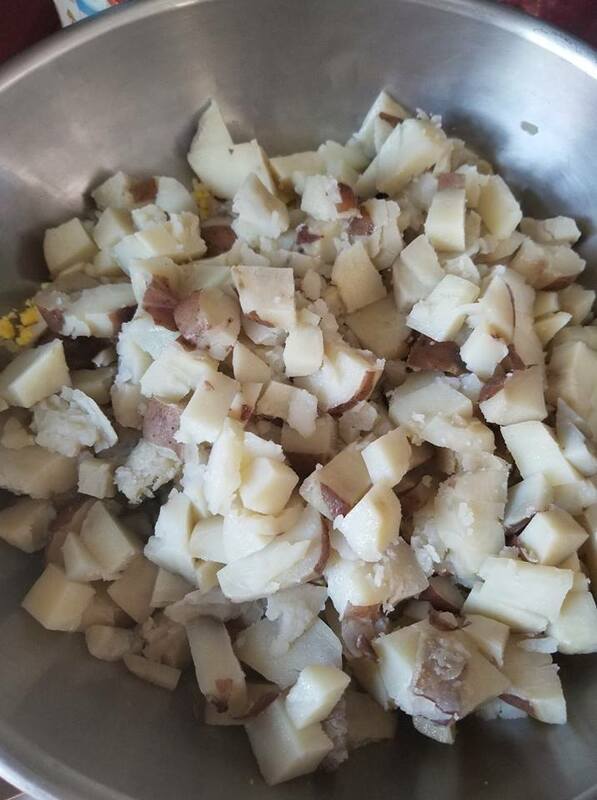 Then add the rest of the ingredients, which for us is potatoes, celery and hard boiled eggs, mix well and add a big spoonful of pickle relish. May try adding your secret ingredient (sugar) the next time I make it! I like big chunks of egg in mine and celery. Sometimes sweet relish not always. 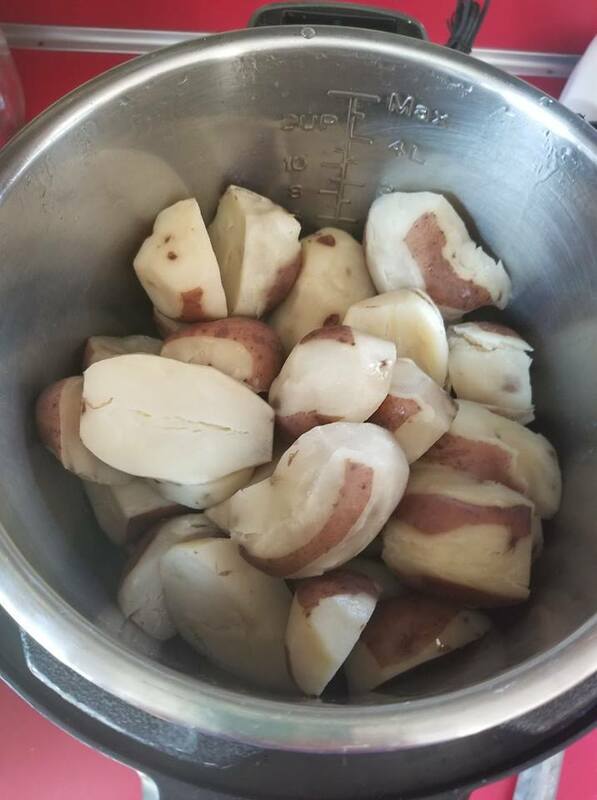 I cut up the potatoes before I cook them (I steam instead of boil). As soon as they are done they get tossed in a bowl and sprinkled with vinegar (usually cider, but white will work) and then let the cool. Meanwhile it’s mayo, yellow mustard, chopped onion, egg and celery, a bit of relish and S&P mixed together. Those get mixed into the cooled potatoes and then into the fridge. It’s really best made the day before or in the morning before. I make mine a lot like the others do. Actually like yours except put dill pickle relish and sweet pickle relish in mine. I love potato salad! I use frozen potatoes O’Brien and the microwave! I hate having to scrub and peel potatoes, especially when they are hot! Sugar, vegetable oil, apple cider vinegar, mayo, mustard, green onions, hard cooked eggs, salt and pepper. We like hot mashed potato salad. That is the way that my Grandma made it. Eggs, mayo, mustard, pickles, salt and paper. Very good. My Mom made the best potato salad. Her secret was putting vinegar on the potatoes while they were still warm, just like Robby. I llike it with hard boiled eggs, purple onions, black olives, and parsley. Unfortunately, I married a man who hates mayo so potato salad is pretty much off the menu. Instead we do german-style potato salad. Mine is about like yours….. my “secret” is to get the dressing on the potatoes while they are still warm so they absorb more of the dressing. Do you use your Smart Pot to boil the eggs? Going to try adding milk next picnic. Our family secret is that it must have pepper relish in it. And only grandma’s homemade pepper relish that takes 3 days to make. Otherwise it just doesn’t have the right zing. I make it like yours, plus celery, and also my mom’s secret ingredient, a tablespoon of cool whip. I make several different ones it depends what we are in the mood for. Sometimes it’s eggs, red potatoes, green onion, bacon sour cream,mayo, salt and pepper. Sometimes it’s yellow potatoes, olive oil, mustard,fresh parsley.salt and pepper. 1/3’s greek yogurt/mayo/miracle whip, eggs-large chop, dill pickles- fine chop, a splash of pickle juice, yellow mustard, garlic salt, pepper. I like red potatoes or new potatoes, yukon golds. How much “sauce” depends on how much potato. Hubby likes it fairly wet while I’ll go a bit drier. I make it exactly the same, except I always put in home canned chopped pickles. About a 1/4 cup and about 1 tbsp of the brine from the pickles. Other than that its exactly the same. I learned from my grandmother who used to make salads for the local cafe. The best compliments I get are from older people at church who tell me it tastes just like the potato salad at the cafe when my grandmother worked there. Pretty much like yours but, no milk and I put in a little lemon juice. We like sliced olives in ours and sweet pickles w/ a little of the juice from the jar, chopped celery/onions , mustard and not that much mayo. Little cubes of cheese and paprika sprinkled on the top and COLD. Whew……..that’s why I don’t make it that often. Interesting to read everyones recipes. I add cooked bacon and a little bacon grease. And for color diced red pepper. Jo I make mine very similar to you except celery is a must. That is for my original potato salad. I also like it with a bit of bacon added and have used sour cream along with the mayo which is Miracle Whip for me. I don’t make it real often because I so enjoy it and eat too much! Lol you are not going to find an onion in my potato salad but you will find egg,tomatoes,celery, cucumber and I have in the past our radish in it. I put salad dressing to finish it off. I am always interested in other people’s recipes have never heard of putting milk in or sugar must give it a try. Definitely cold. I always add chopped homemade Society Chip Pickles….the kids say it’s not homemade without them. The dressing for the potato salad is just about the same. My sister and I like it right after it’s made and the kids like it the next day when it’s very cold, just like their dad did. How about a low cal salad use cauliflower instead of potatoes. Cook your cauliflower till tender. Add mayo,pickles,celery and what ever you like in your potato salad. You really wont know its cauliflower. I had a good friend who cut her potatoes up hot and poured some pickle juice on it while they were still warm, then added all the other things that everyone else does. She made the BEST potato salad-I have never been able to come close to hers! Thanks for asking how others do make potatoe salad. I can no longer eat potatoes or pasta, well I could if I could limit my eating of all those carbohydrate. So Brenda mentioned using cauliflower instead of potato makes my day as I understand cauliflower is a much lower food. I got a recipe from our church cookbook provided by my friend, Rhonda that uses cooked vinegar, egg yolks, dry mustard, sugar, onion flakes, salt and pepper. Once it cools add prepared mustard and a jar of Miracle Whip. It works well for macaroni salad and she uses it for egg salad, beef salad, and chicken salad sandwiches. I use more mustard, as I like my potato salad to be more on the yellow side of things. I also use radishes and cucumbers in mine for more crunch. Sometimes I use pickle relish, other times not. One of my very most favorite summer salads! I love potato salad! I have been making it often now that I have an Instant Pot. I wash the potatoes really well and put them on the trivet. Then I break about six eggs into a Pyrex bowl and put it on top of the potatoes. High pressure for 7-8 minutes then quick release. Once the potatoes cool enough to handle, the peels slide right off and I can chop them up. 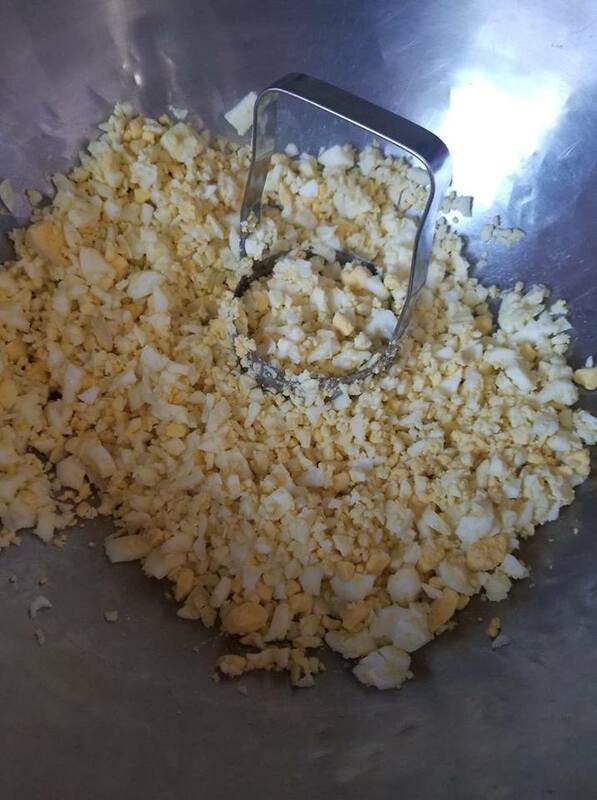 The eggs get chopped too and then I add green onions, pickles, mayo, mustard, salt, pepper, paprika, and celery if I have it. Our family also uses sugar in the dressing. We add Spam and dill pickles and apple to the salad. Everything has to be precisely, finely diced. It takes hours to make!